Hello friends! 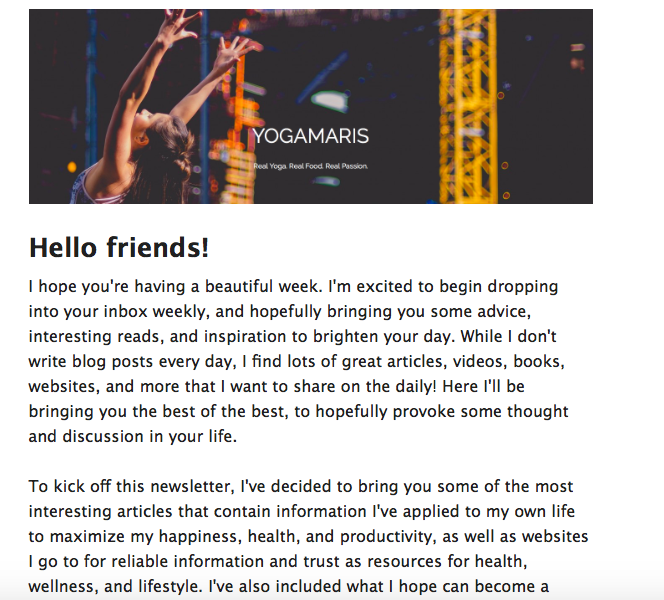 I'm excited to share with you the news that I'm beginning a weekly newsletter! I'm sure you're somewhat familiar with the premise: you sign up with your email to receive information, news, and updates from your favorite websites, brands, and blogs. But I'm also sure that you're familiar with how full and inbox can become, and how sick you can get of receiving spammy messages because you gave Forever 21 your email back in 2010. Not to worry, this newsletter is a little different! Here I'll be compiling the best of the best that I want to share with you! That's going to mean a short message from me about what's on my heart and what I feel is important to start a conversation on, my answers to the questions I get here on my blog and on social media, the most interesting news articles and inspirational writings I can find, my favorite recipes from around the web, my old blog posts from the archives, and just about anything that I feel is relevant, valuable, and helpful to include. Don't worry, it's all been made well-contained and easily digestible for you. This is a great way to ensure you stay up-to-date on any special events I'm planning, workshops I'm hosting, or charities I'm supporting. It's also one of the best ways to make sure your week is filled with some inspiration that will keep you uplifted, informed, and empowered on all things health and wellness. The newsletter will start rolling out once a week very soon, so go ahead and take a few minutes now to sign yourself up! If at any point you think, "Hmm, I think there's a bit too much Maris in my life right now" (I get it), unsubscribing is easily available at the end of any email you'll receive from me. So go ahead and take the leap! This is a free, noncommittal resource I'm beyond happy to offer you. Below are some screenshots of what you can expect to receive in your inbox on the weekly. Take a peek!